Unborn But Forgotten is another one of those horror flicks in the tradition of The Ring and Phone whereby people die after coming into contact with a cursed item. This time around the deaths don't occur after watching a video or receiving a phone call, but after visiting a website, and it only seems to affect women. Lucky for us, one of the two main characters happens to be a woman. Her name is Soo-jin, and she's a reporter doing a story on the other main character, Eun-ju Lee, a cyber-cop. Lee is investigating several mysterious deaths of women who, 15 days prior to their death, had visited a specific women's clinic website... one that does abortions. Er, the clinic that is, not the website. I've never known a website to perform abortions... then again, I've never known a website that kills women 15 days after they visit it either. Okay, now for the weird part (as if dying 15 days after visiting a website isn't weird)... the women who die... well, they're kind of pregnant, but not really. Let's see if I can explain this so it makes sense. Toward the beginning of the movie, before we meet our main characters, we see a chick laying on a bed squiring in pain. At first, she looks normal, as in not obviously pregnant, but then only seconds later her belly shows that she is pregnant. Okay, now fast forward a little bit and we're at a dance club with Lee and Soo-jin. A woman on the dance floor all of a sudden keels over in pain, and dies. This woman looks normal, as in not obviously pregnant, except for when Soo-jin looks through the screen on her video camera as she records what's happening, in which the woman's belly shows as if she is pregnant. Spooky. After the incident, Lee and Soo-jin review the video, only to find that it's messed up at the point where Soo-jin saw the pregnant belly. The autopsy shows that the woman died same as the others, her uterus swelled so rapidly that it crushed her internal organs, as if she had become insta-pregnant right before her death. Well, at least that would confirm what Soo-jin saw. Now it's just a question of how long it's going to take them to start believing in the supernatural. So what'll they do until then? Well, Lee will track down the webmaster of the site while Soo-jin will check out the website for herself. Yeah, smart move there lady. But maybe it'll be okay, I mean that website only kills women who have had abortions, right? Oops, I forgot, she just recently did! What an amazing and horrifying coincidence! Now Soo-jin must race against the clock to find out exactly what it is that's killing these women. Heyyyyy.... you think it might be the ghost of an murdered fetus? Nah, that'd be tooo obvious. There's no way they would make it that obvious. I mean, what kind of mystery would that be? Hm... um.... what else can I say without giving away the "secret"... well, the woman who visit the site that end up dead all saw themselves in a white room, along with another woman who was holding a baby... and when they got closer, they found that the other woman was actually themselves! And then they saw themselves dying! And then fifteen days later they kick the bucket... and I've already mentioned that part like 100 times... okay, well I guess that's about all I can tell you about the story. The film, like the other Tartan's Asia Extreme releases, looks wonderful. Too bad it's not nearly as engaging. The story is very flat, as are the characters. They have very little dimension to them at all. The cinematography and lighting is well done, as expected, and the sound does exactly what it's supposed to. There are some creepy moments, but not enough to make this a tense or engaging film. If you really want to see this type of a movie, I'd go with Phone instead. It has the same basic premise but is done much, much better. The DVD extras for Unborn but Forgotten include two short interviews with the leads, an hour long "On the Set" featurette, and then the typical photo gallery, trailer, and previews for other Tartan Asia Extreme releases. 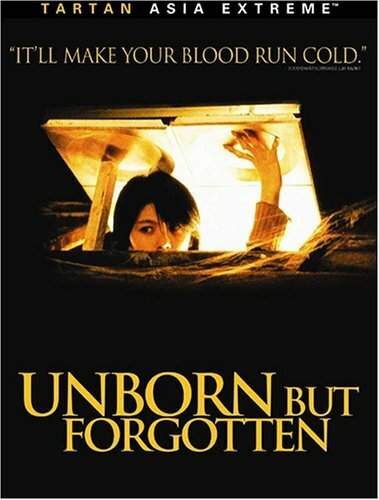 Unborn but Forgotten was released by Tartan Asia Extreme on DVD on October 11, 2005. It was directed by Im Chang-jae, and stars Jun-ho Jeong as Lee Seok and Eun-ju Lee as Han Soo-jin.